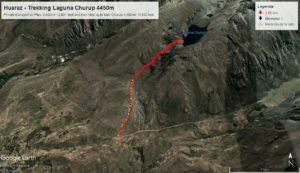 Daily distances on the Huayhuash Circuit Trek. 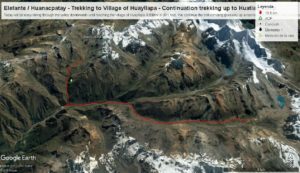 Here is some additional information about our Huayhuash circuit trek. If you would like to find out more about our trips to this amazing part of Peru, get in CONTACT today. We are always happy to chat. Arrive in Lima. You will be picked up from the airport and transferred to the Kamana hotel. The rest of day will be spent relaxing or heading out sightseeing in Lima. 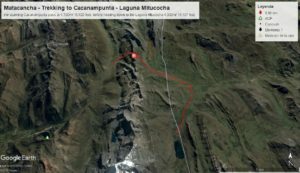 Day 2: From Lima – Private bus to Huaraz (3100 m). The trip is 400km and takes 8 hours. Depart Lima to the mountain town of Huaraz 3,100m/ 10,170 feet, which is located north east of Lima. This 8 hour drive takes in spectacular views of the Callejón de Huaylas. Huaraz is the gateway to the Huayhuash Circuit Trek and the Cordillera Blanca and Huascaran National Park. There are public bus and private bus options for this journey. We use the Andino Club Hotel. Today is an acclimatization and organization day in Huaraz. We will sort out gear, tents and equipment. 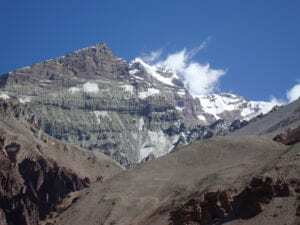 We will also take private transport to Pitec 3,850m/ 12,631 feet and then hike up to lake Churup 4,460m/ 14,632 feet. before returning to Huaraz for the night. Round trip hiking will be 6 hours. Today is another acclimatization day. It is critical to acclimatize well at the beginning of the trip. This gives you a better experience and enjoyment going to higher altitudes. We will head out again from Huaraz. 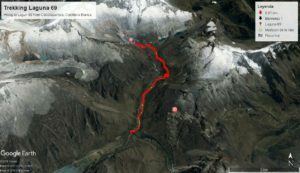 We will also take private transport towards the valley Santa River, pass the village of Yungay driving via Quebrada Llanganuco and Cruze Celbollapampa 3,850m/ 12,631 feet. 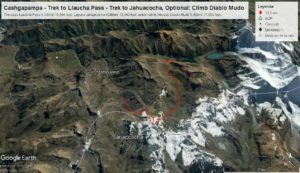 From here we will hike up to Luguna 69 4,650m/ 15,256 feet for some amazing viewing before head back to Huaraz for another night in the hotel. We will be up early for breakfast and we will get packed up and ready as our Huayhuash Circuit trek is underway. The early morning mountain views from camp get you excited for the journey ahead. 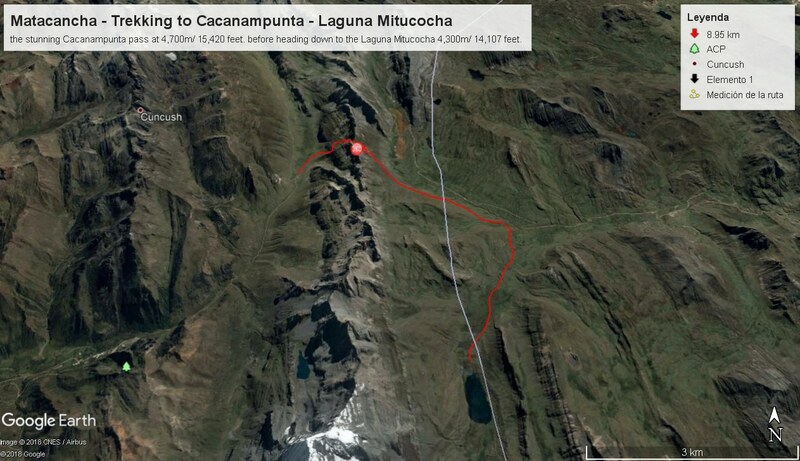 From Matacancha, we will trek up steeply to the stunning Cacanampunta pass at 4,700m/ 15,420 feet. before heading down to the Laguna Mitucocha 4,300m/ 14,107 feet to sleep for the night. Today is 4 hours of walking. 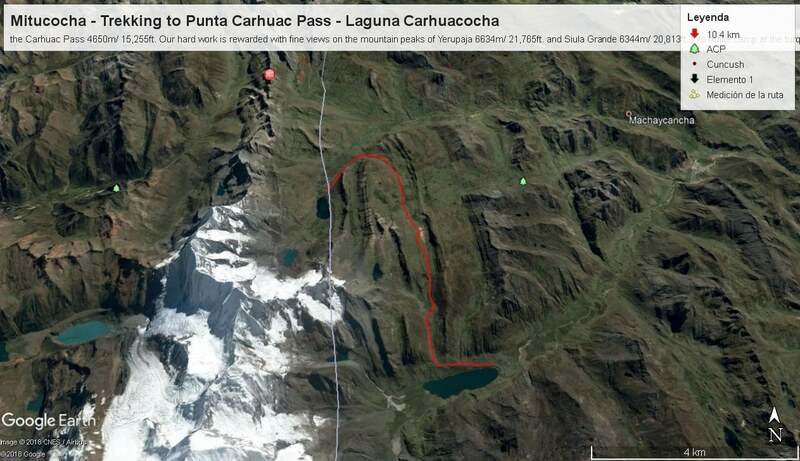 We will be up early for breakfast and start the day heading up to the Punta Carhuac Pass 4,640m/ 15,256 feet. 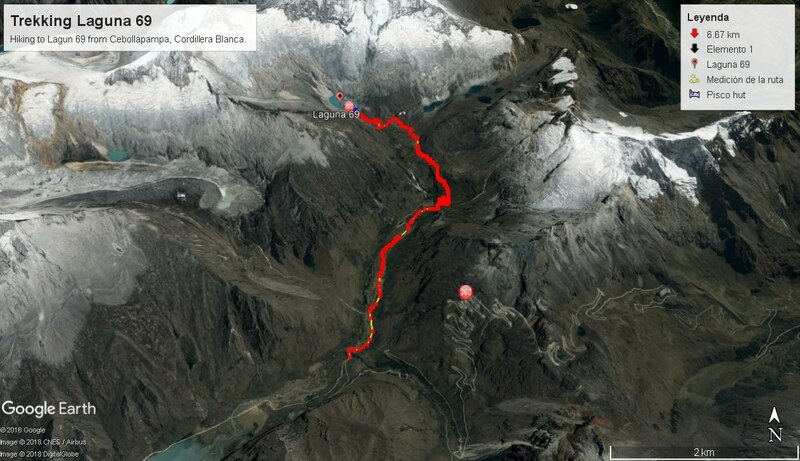 Today we follow the Quebrada Caliente until we begin our climb up to the second pass, the Carhuac Pass 4650m/ 15,255ft. Our hard work is rewarded with fine views on the mountain peaks of Yerupaja 6634m/ 21,765ft. and Siula Grande 6344m/ 20,813ft. We walk on dirt trails to the top of the pass to enjoy great views of glaciers streaming down around stunning rock walls. The Siula Grande is renowned for the mountaineering story of Joe Simpson and Simon Yates told in the book and film ‘Touching the Void’. Descending the pass into a grassy valley allow for more views on high peaks of the Cordillera Huayhuash, each more spectacular than the other. We make camp at the turquoise green colored Lake Carhuacocha 4150m/ 13,615ft. with mountains Yerupaja and Jirishanca prominent at the background. This lake offers great photo opportunities when still conditions transform the lake into a mirror, sharply reflecting the snow-capped mountains. Walking time is 5-6 hours. 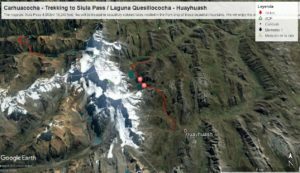 Today we trek towards the majestic Siula Pass 4,950m/ 16,240 feet and one of our favorite days of the trip. You will be treated to beautifully colored lakes nestled in the front drop of these beautiful mountains. We will enjoy the views and continue on to Laguna Quesillococha Huayhuash at 4,450m/ 14,600 feet. Walking time is 8-9 hours today. From the Huayhuash camp which is home to herders of Alpaca and Vicunia. 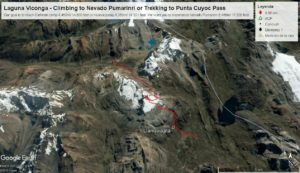 Our early morning trek start as we head over the Portachuelo de Huayhuash Pass 4750m/ 15,583ft. This pass offers great views on the remote peaks such as Puscanturpa, Cuyoc and Millpo of the Cordillera Raura located to the southeast of the Cordillera Huayhuash. 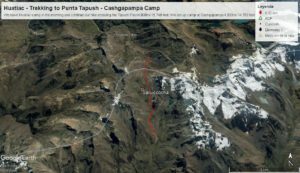 We will set up our camp and let our bodies soak in the well-deserved natural hot pools towards the village of Viconga 4,400m/ 14,436 feet and set up our camp for the night. Walking time is 4-5 hours today. Today we leave this beautiful camp site and we have options. Our goal is to reach Elefante camp 4,450m/ 14,600 feet or Huanacpatay 4,350m/ 14,271 feet. 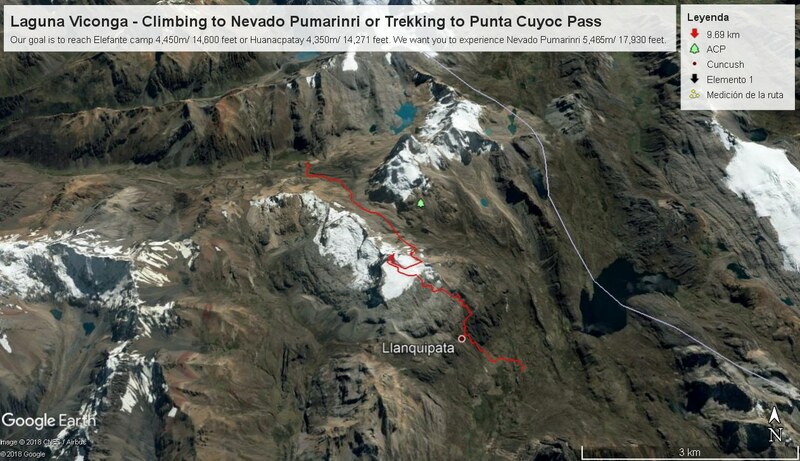 We want you to experience Nevado Pumarinri 5,465m/ 17,930 feet. This is the highest point of the full Huayhuash circuit trek. From the pass we will have a spectacular panorama view on the Huayhuash peaks in the north and the Raura peaks in the south. Further a stunning view of the glacier of Puscanturpa 5650m/ 18,536ft. completes this awe-aspiring experience. We continue our hike by descending from the pass towards Quebrada Huanactapay and set up camp. This is a long day of walking and climbing and will be 9 to 10 hours. Today is another day of peaceful, beautiful walking. We trek up to the barron Llaucha Pass 4,750m/ 15,584 feet. and down to the beautiful Laguna Jahuacocha 4,066m/ 13,340 feet. There is the option of an early morning start and climb to the mountain summit of Diablo Mudo 5,350m/ 17,552 feet. This is a mountaineering day and equipment is required for a safe summit.